Low maintenance, highly versatile and reassuringly green all year round, artificial turf is fast gaining ground. 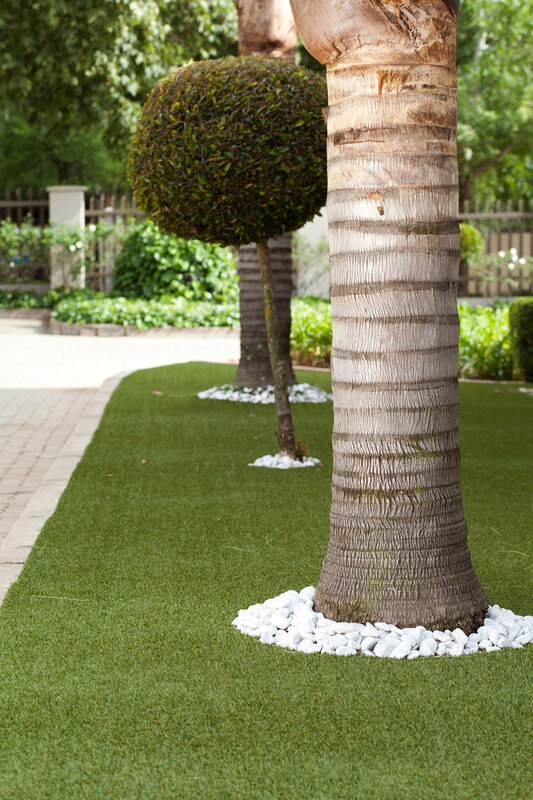 Here are some stylish ideas for gardening with artificial grass PLUS we show you how to install and care for faux turf. Loft apartments and rooftop terraces are ideal candidates for an artificial lawn. 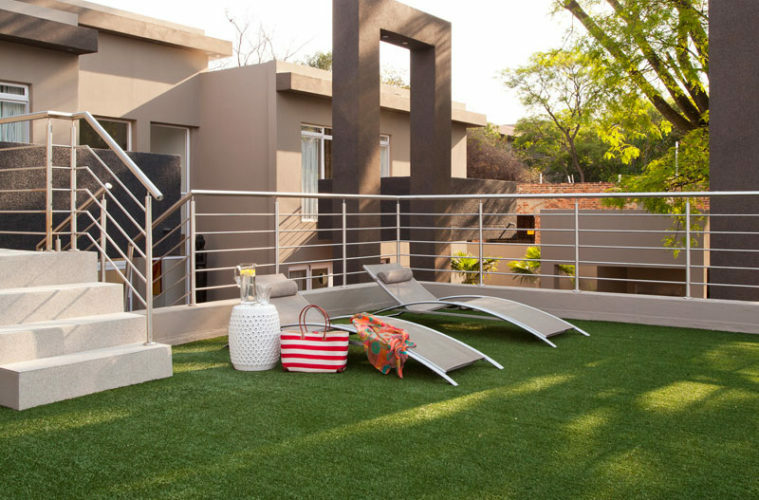 What would have been a hot, concrete expanse in this modern Bryanston cluster was converted to a plush sun terrace for year-round use with the installation of Belgotex Floorcoverings’ DuraTurf Pavilion by Fourways Carpet & Decor. 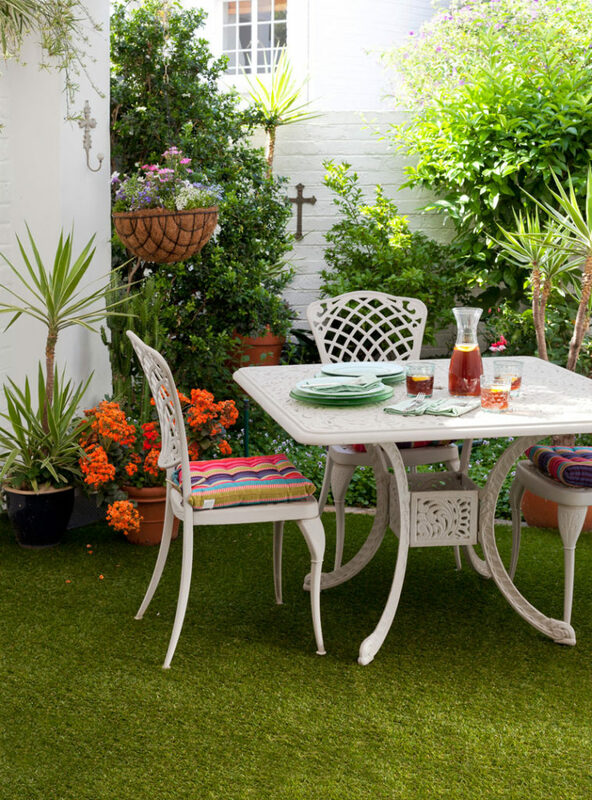 Artificial grass can be an instant pick-me-up for small-space gardens and courtyards. This obviates the need for noisy mowing and maintenance and is ideal for lock-up-and-go homes. Here, a custom-cut piece of DuraTurf Country Club Fairway Green from Belgotex Floorcoverings was placed directly onto an existing tiled courtyard under partial cover. Heavy-duty Velcro is sufficient to keep it in place, an intentionally temporary solution should the owners want to revert to tiles. A major benefit of artificial grass is that you can have perfect lawn beneath shady trees – no more patchy areas due to lack of sun. Here DuraTurf Country Club Autumn Green was placed at the edge of the chosen area and then cut to fit snugly around the trunks. To finish off, try adding a textural element such as white pebbles to the base of your trees. 1. Lay a flat concrete screed and allow it to dry thoroughly. 2. Add your pavers and allow the cement securing them to dry. 3. Cut the turf to size and glue it down around the outer edges and between the pavers. Major benefits include no watering, mowing or fertilising, plus high UV resistance. The longevity of artificial grass is around 10–15 years. Expect to pay from R150 – R450m², depending on your application. (This excludes delivery, installation and cutting to size.) Available in 4m-wide rolls, there’s a wide range of grass types and shades of green to choose from, with tuft heights ranging from 10–40mm. Ask your supplier to recommend the best type for your specific site, usage and overall look. When applying artificial grass to hard surfaces such as concrete, tarmac and stone, it’s vital to ensure that you have the correct gradient for water run-off. The grass sheets are then loosely laid on top and secured with all-weather adhesive around the edges. For garden applications, the existing grass must be removed to create a compacted recess. A mix of crusher dust and river sand is applied, plus a weed barrier to create a stable, porous base. Seaming tape is applied to the edges and the artificial turf is attached to pegs placed in the ground. Silica sand in-fills are then added to weigh the turf down, cool the surface and help keep the tufts vertical. 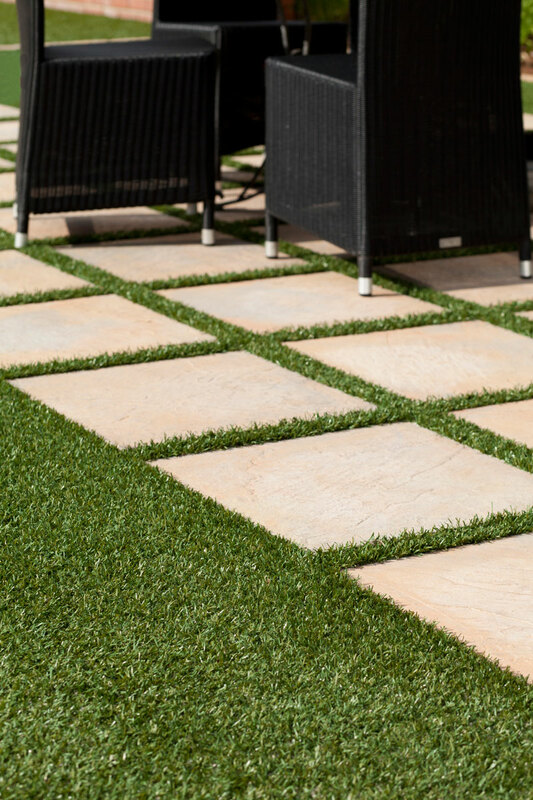 Keeping it clean: Artificial grass is made from tufted polyethylene; it contains fine holes to allow water to penetrate. To clean it, simply hose it down.